First, a little background. 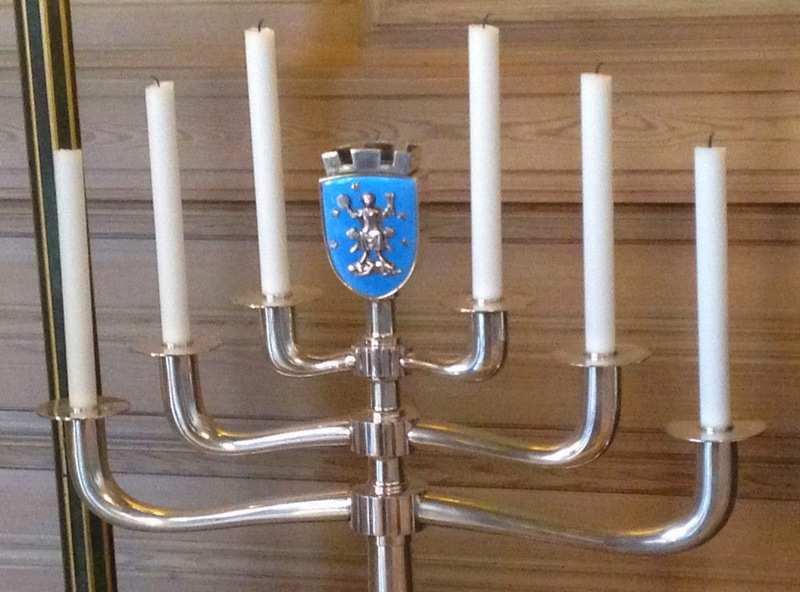 It helps to understand the coat of arms of the City of Oslo if you know that they are based on the story of St. Hallvard. Hallvard gave sanctuary on his ship for a woman who was fleeing from three men accusing her of theft. Hallvard and the woman were both killed by arrows from the men. The woman was buried on the beach. Hallvard was bound with a millstone around his neck and thrown in Drammensfjord, but despite millstone as weight, Hallvard’s body miraculously floated to the surface and the men’s crimes were discovered. 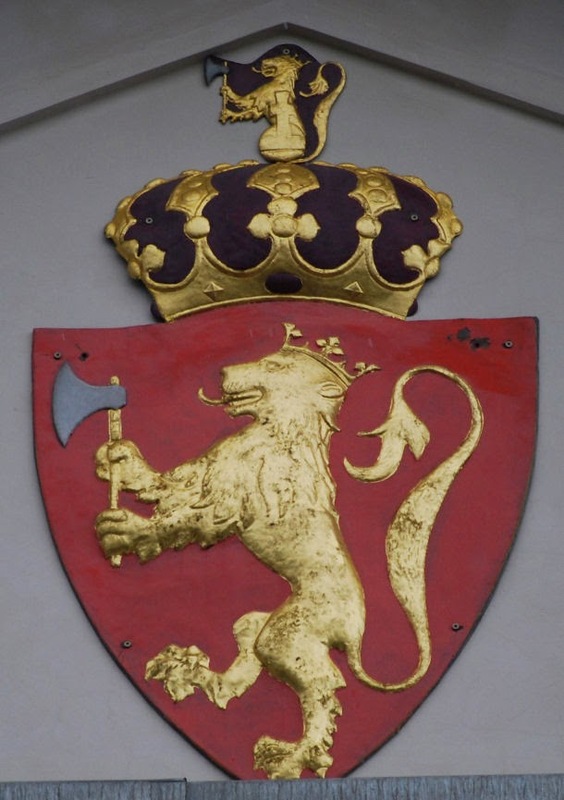 St. Hallvard has been associated with the city of Oslo since at least the 14th century, when his image appeared on the city’s seal. 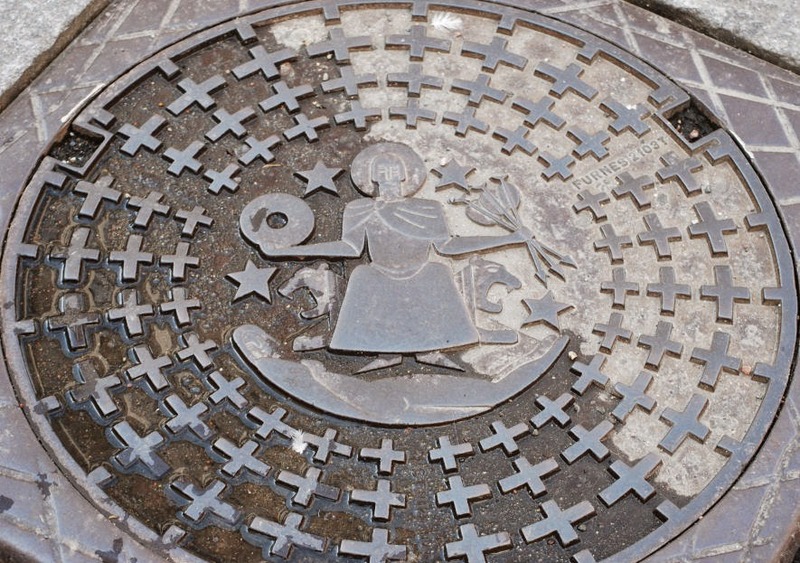 In the images of the city’s arms, found here from all about the city (even including on some of the manhole covers on the city's streets), you can see the saint with his attributes, the millstone and three arrows, with the woman he tried to save lying beneath his feet. Sometimes the shield is scattered with a few stars, and usually his seat shows bear or lion's heads to each side. 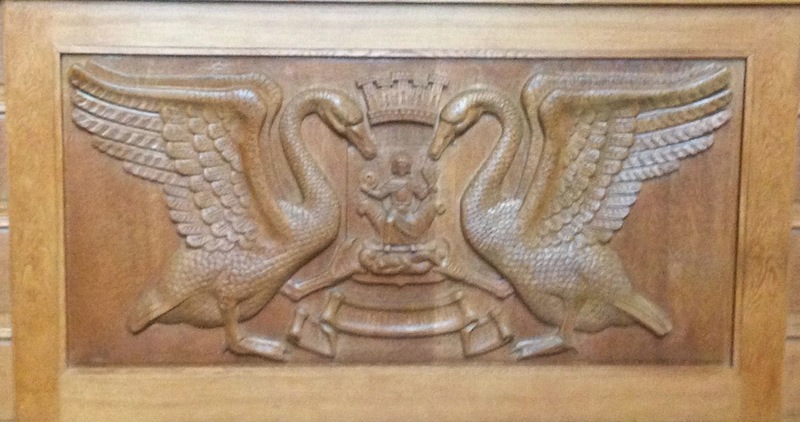 In most cases, as you can see from the above images, if there are supporters with the shield, they are swans. 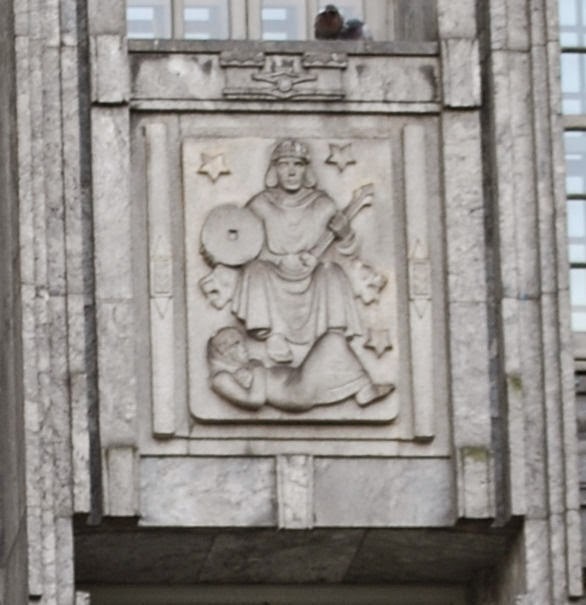 But I did find one image from the Christiania Sparebank building (right across the street from our hotel, as it happened), in which the supporters are lions rampant reguardant. 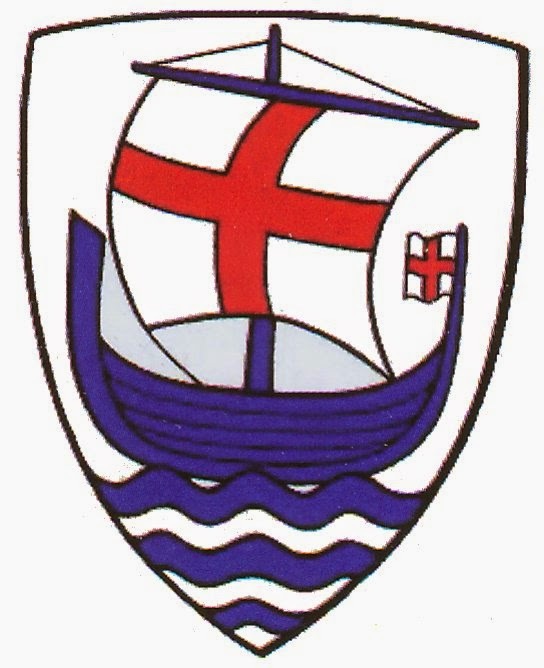 Finally, there is a simplified version of the arms, showing only the saint's attributes, the millstone and the arrows, while leaving out everything else. It was really nice to be able to walk about the city, and visit the City Hall, and see all the uses made of its coat of arms/seal. 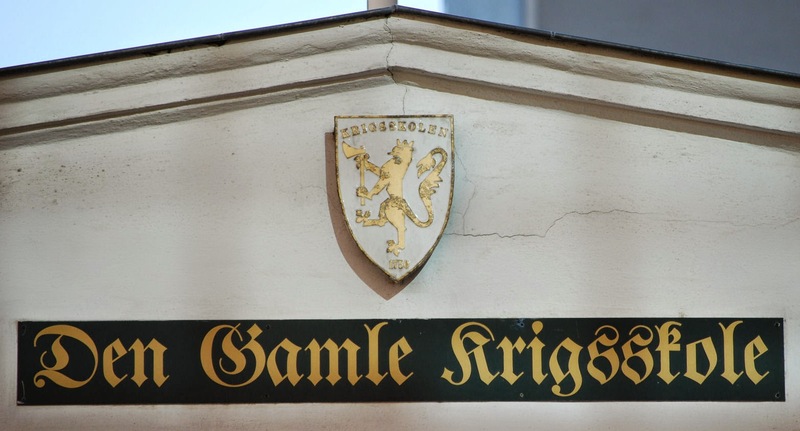 Of course, whenever you go looking for heraldry, you are likely to find some, even - or sometimes especially - when what you see is totally unexpected. 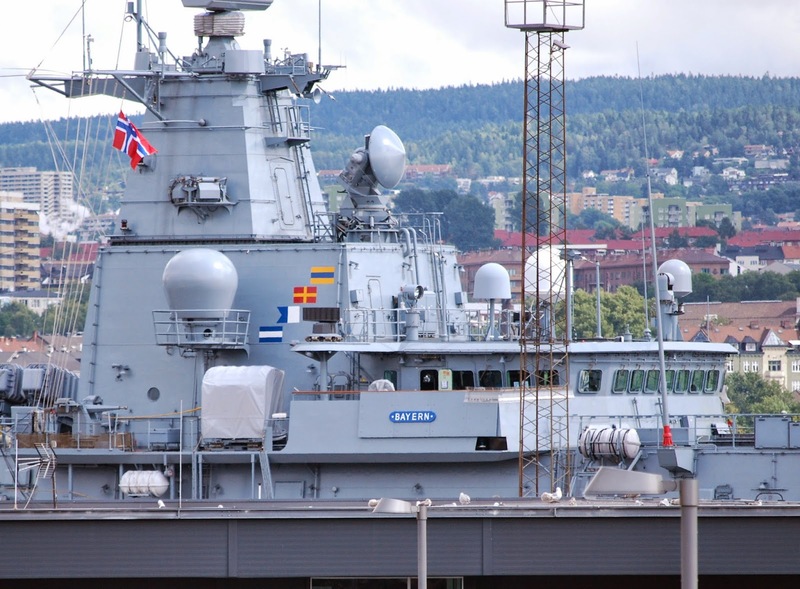 While we were visiting Oslo for the Congress, the city had another visitor, the FGS Bayern, a German Type 123 Brandenburg class Frigate. And though its lower hull was partially blocked by cargo containers and whatnot, I managed to find the arms of Bavaria which mark this ship. Don't be confused because the placement of the arms in relation to the gun turret looks "off" in the photo above compared to those on the Seaforces website; in the picture above they had the gun turret rotated to face aft while they were working on it. 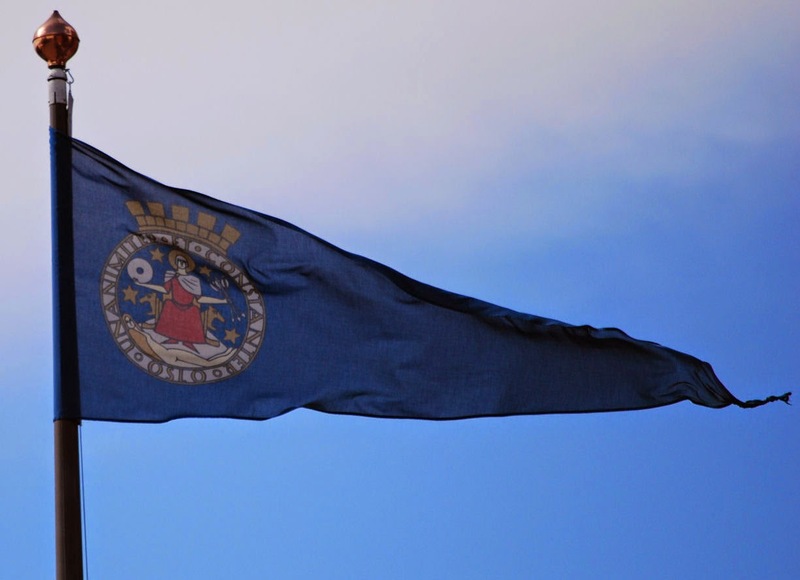 It was a neat thing to see, combining two of my loves as it did -- heraldry and naval ships. 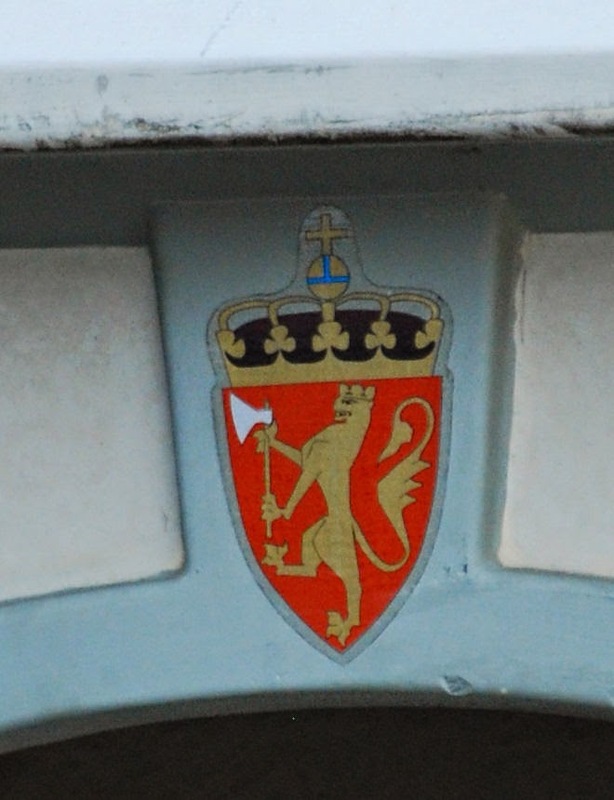 Still at the Akershus Fortress, near a guard house at the main vehicle and pedestrian entrance, was a folding freestanding sign holder with this coat of arms at the top. 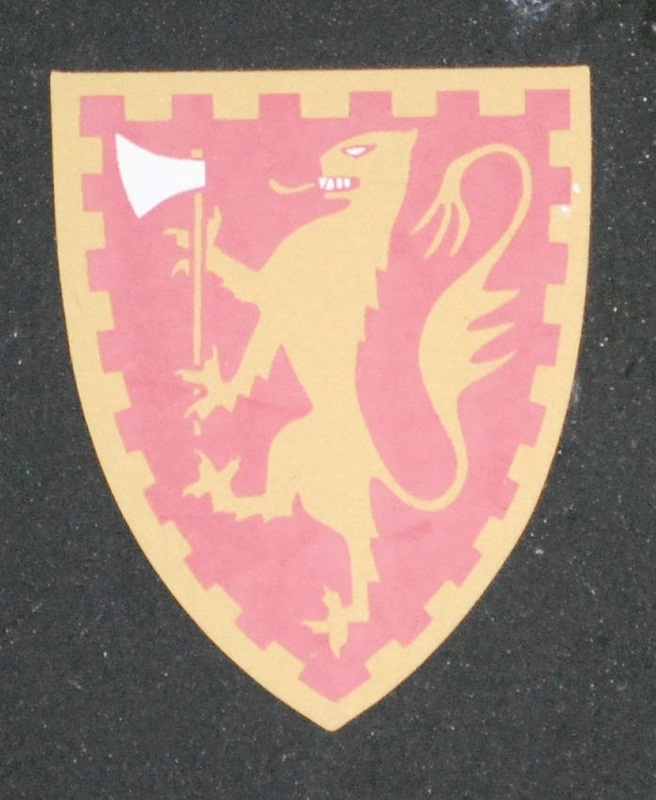 I just thought this was a really great heraldic representation of the function of this particular position, guarding the border (heraldic bordure) of the Fortress and the kingdom. 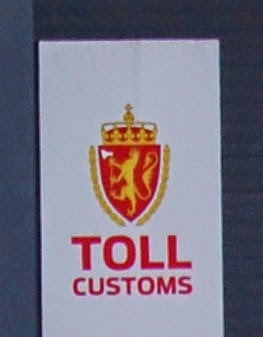 And from the rampart of the Akershus Fortress I saw this sign on a building near the waterside, with the word "Customs" in Norwegian and in English. 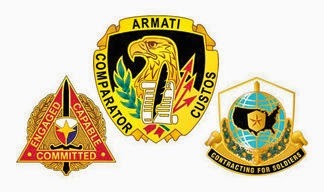 There was a recent (August 20, 2014) article entitled “Military customs, traditions inspire unit cohesion” published in The Redstone Rocket, a periodical “published in the interest of personnel at Redstone Arsenal, AL” [Alabama], that briefly discusses how the use of unit insignia in the U.S. military helps to build esprit de corps, as well as giving a few examples of such insignia (mind you, the examples shown in the article, and copied immediately below, are not especially heraldic) and unit mottos. Mention is also made of The Institute of Heraldry, the closest thing the United States has to an heraldic authority. The Europeana Heraldica database is a compilation of the municipal coats of arms of Finland, Norway, Sweden, Denmark, Iceland, and other states – both historical and in official use currently. It includes more than 2,200 civic coats of arms (cities, provinces, regions) and over 1,000 wax and paper seals. The oldest seal is from 1309 and the most recent from 2009, so there’s a good range of examples to look up. 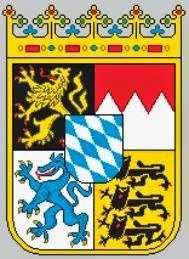 All of the arms can be searched by keywords categorized in terms of heraldic concepts, including the division of the shield, the colors of the coat of arms, and so on. 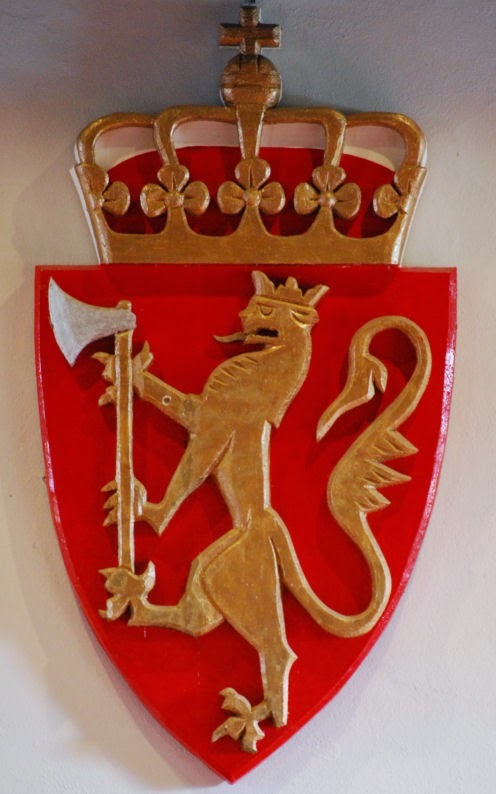 For example, the keyword "lion" returns 40 coats of arms from four countries. Coats of arms can also be searched as a text search according to the name of the possessor. 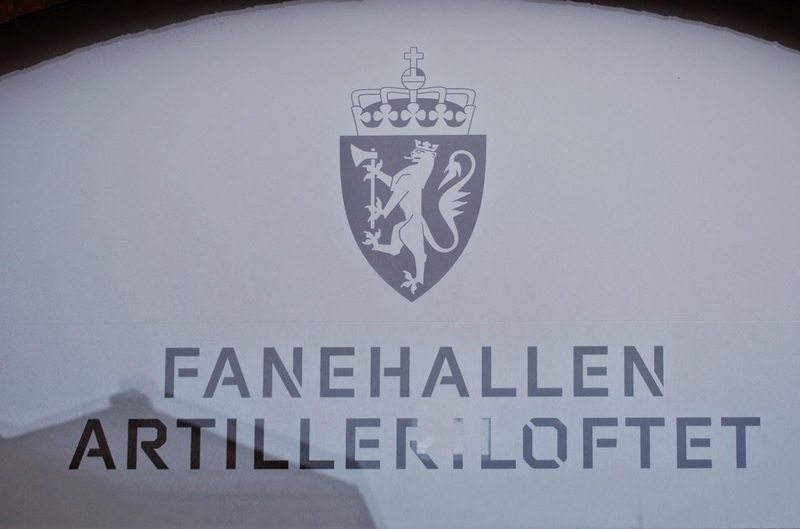 The database can be searched in 13 languages, so no one has the excuse of being unable to read Finnish (or Italian, or Dutch, or Polish, or …). Well, maybe solved, but only in part. 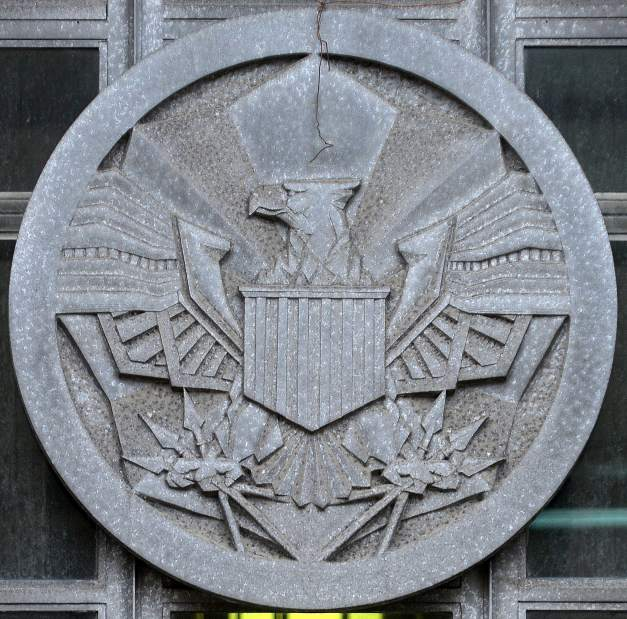 She'd seen an earlier post I'd done on this blog about another Art Deco-style depiction of the arms of the United States on a Post Office building in High Point, North Carolina (http://blog.appletonstudios.com/2011/07/heraldry-in-high-point-north-carolina.html) and had some questions and wanted my thoughts about the one in New Kensington for an article she was writing for the Valley News Dispatch in western Pennsylvania. She emailed me just before we left to attend the XXXI International Congress of Genealogical and Heraldic Sciences in Oslo (heraldry pictures of the trip, which included a week in England following the Congress, will be forthcoming), and I haven't had the time to read her article or post about it until now. As my alter ego Da'ud Bob ibn Briggs, Historical Drive-In Movie Critic, would say, "Check it out!"